Strange encounters in the tomb of a woman sufi. Evenings at Hazrat Nizamuddin dargah. Sometimes, too much crowd, too many tourists, and too loud qawwalis. No peace, no quiet, and no place to sit. But I know a secret refuge. 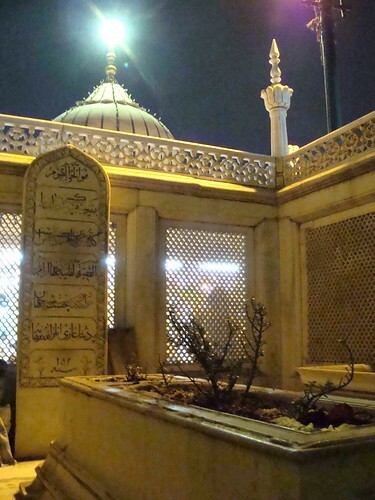 After doing my haziri round, I go straight to Jahanara’s tomb, enclosed in a walled chamber at one end of the dargah courtyard. Usually no one is here except an old gentleman who has adopted the place as his night shelter. He is the Living, the Sustaining. (may God illuminate his proof). In this place I have chanced upon strange encounters with different sort of people. Man: Maa, forgive me. I have hurt your heart. I will never do it again. You raised me. You brought me into this world. You nourished me with your milk. Ammi, mujhe maaf kar do. Please forgive me. He went on sobbing for a few minutes. He thought he was alone and not wishing to unnerve him, I held my breath and did not move from my corner. Man: What do you mean by this? Me: What do you mean, janab? Man: Don’t seek dua from graves. Ask Allah. This won’t help. Don’t talk to tombs. The man is shaking my shoulders. I push him away, but gently, and again bow down to Jahanara. Woman: O son, give some paisas to this old woman. Me: I have nothing. Maafi. Woman: So you won’t give any to me? Woman: Hai hai. With what face have you come to the dargah then? I make no reply. Her large nostrils are flaring in disgust. Woman: I swear by Him (she points to the dome of Hazrat Nizamuddin mazaar) that you will never be happy in life. I have faith in Jahanara. But could this be the same Jahanara who used to share her father the King’s bed while alive? The one of whom he said it was ok to pluck a fruit off a tree one had planted oneself? If so, there is hope for all pervs. Please clarify.